The Gossainishina Halamni Ronjali Bwisagu Kungfung Afad committee of 12 villages of the Gossainishina areas like Gossainishina, Gwjwnpuri, Tengaigaon, Ouguri etc celebrated Ronjali Bwisagu and Bihu at Gossainishina playground in Kokrajhar district. 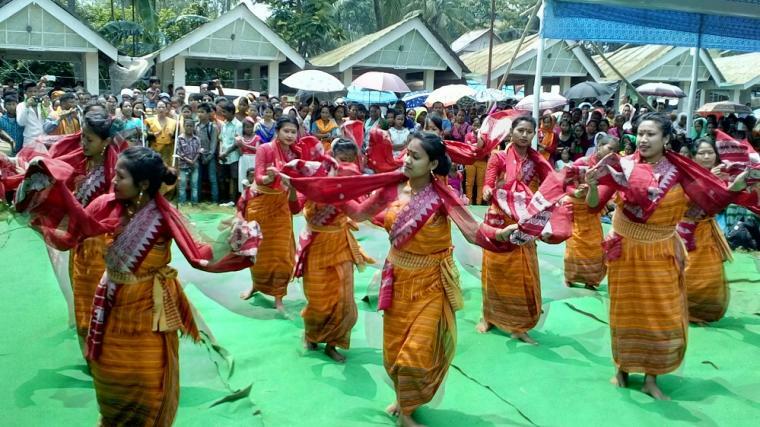 Around 120 government officials and employees like Additional Deputy Commissioner (ADC) of Bijni, Gukul Brahma, DFO, schools inspectors, advocates, employees of Bodoland University, teachers, professors, defence personnel, including retired persons and thousands of villagers celebrated the spring festival jointly at Gossainishina playground with various traditional instruments like kam jota, sifung flute, senja amid a joyful and festive atmosphere. He also said that they have organized various programmes in connection of Ronjali like quiz competition, Bwisagu dance competition etc and felicitated seniors citizen and meritorious students too.